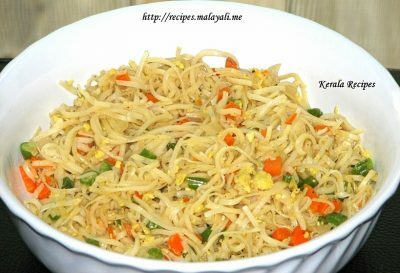 Here is my recipe for making quick egg noodles. You just need to grab a few carrots and beans and you can make this within 20 minutes. Boil the Noodles with a little salt according to the instructions on the packet, till it is almost cooked. Drain and allow it to cool. Add a pinch of salt and pepper to the eggs and beat it well. Keep it aside. Heat 2 tbsp of oil in a big non stick pan or wok and add onions and saute till translucent. Add carrots and beans and stir fry on high heat for around 5-7 minutes till it almost cooked but crispy. Push the veggies to the sides and make a hollow at the center of the pan and pour the beaten eggs. Scramble it well when the egg begins to set. Season with salt and pepper. Blend in soy sauce and chilly garlic sauce. Stir in the cooked noodles and combine everything gently. Season with more salt and pepper, if required. Sprinkle a pinch of MSG for more taste (optional). Toss the noodles on medium-high for another 2 minutes. Your egg noodles is ready to be served.